Rich Media Ads - Impress. Engage. Convert. Use the immense power of the HTML5 technology to create spectacular interactive ads. Code-free. 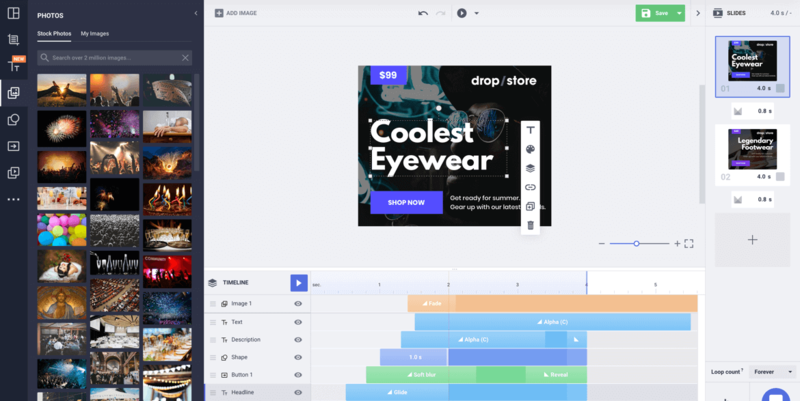 Bannersnack is an easy-to-use, web-based design platform with a huge stock of superb ready-made templates, images, clip-arts and popular fonts. Integrate video or audio media and create a state-of-the-art banner ad. Choose a size from our preset size panels or your own custom size. Then, set your background. You can either select one from our gallery (image, color, texture) or upload your own image. We offer an abundance of design elements for you to build your ad: beautiful images, clip-arts, buttons and popular fonts. Add your video or audio media to convey your message to your audience. Simply embed the code in the banner and adjust its placement. 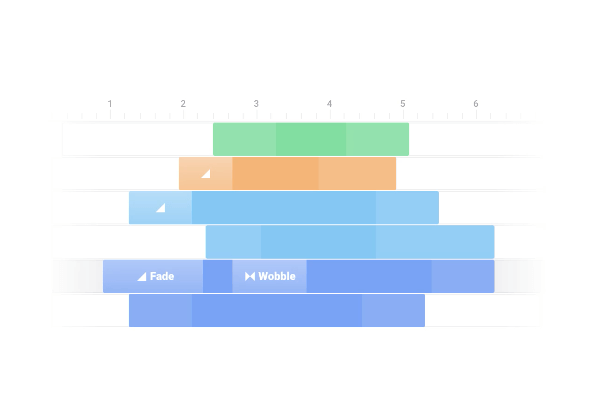 Add animation effects and set timings for each one of your elements using our highly intuitive and easy-to-use Timeline feature. Or, take a shortcut and use our powerful Magic Animator tool to make your ad come to life. Save and download your banner! With Bannersnack you can export to rich media formats such as GIF, MP4 or HTML5. Or, copy the embed code and paste it to your website. The rich media content created in Bannersnack is compliant with all the major advertising platforms' standards, from Google Ads to Facebook Ads. Bannersnack offers the most advanced online editor packed with all the necessary tools. It features a complex, yet intuitive animation timeline and a dynamic slide management system, everything wrapped up in a user-friendly interface. 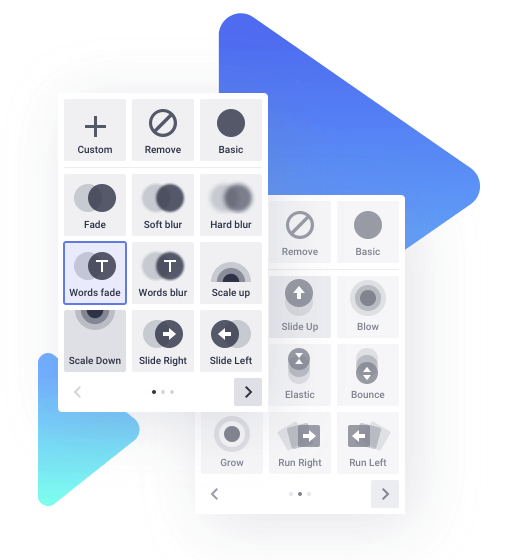 Bring your designs to life by creating intricate animations using effects and transitions from our library. Bannersnack features 32 presets that will make animating any design easy. Video ads can be a huge boost to your advertising campaign and the good news is that you don’t have to be an art director to create slick video banners. 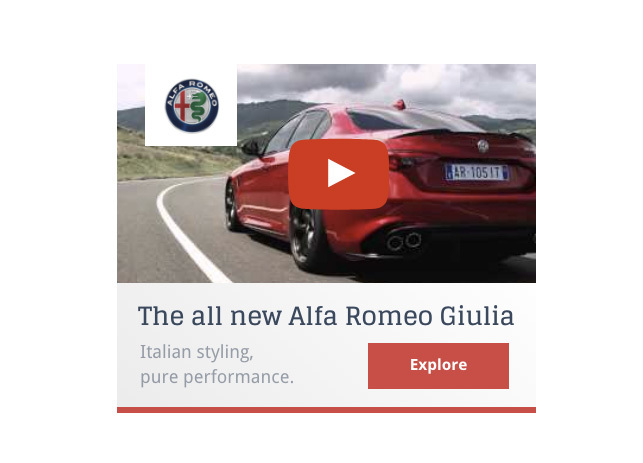 With Bannersnack, embedding videos into banners is a one-click job. What is rich media exactly? Rich media ads are highly innovative and interactive ads that utilize the intelligent HTML5 technology. This type of complex ads incorporates numerous types of elements such as video, audio or other media elements that invite a user to interact and engage with the ad. The possibilities to build rich media banners and to creatively surprise the people surfing the internet are endless. These ads can take the form of pop-ups, floating banners, expanding banners, peel-offs, push-downs, lightboxes, in-stream video ads etc. More and more marketers include rich media ads in their online marketing campaigns because of their excellent results: higher user engagement, conversions, and sales. Rich media ads can outrun standard and animated display ads with increased click-through rates and conversions by as many as five times. With Bannersnack you can create rich media ads for AdWords and for all of the major ad networks. We meet all requirements and deliver ready-to-use, high-quality rich media banner ads. All you have to do is upload them. Trust Bannersnack in helping you deliver spectacular rich media advertisements that will help you get more traffic to your website and convert internet users into your customers.